Jennie M's Stampin Spot: Happy Thanksgiving! Happy Thanksgiving! I have SO much to be thankful for! So I made this thank you for a customer order. I used the Freshly Made Sketch#62 here. 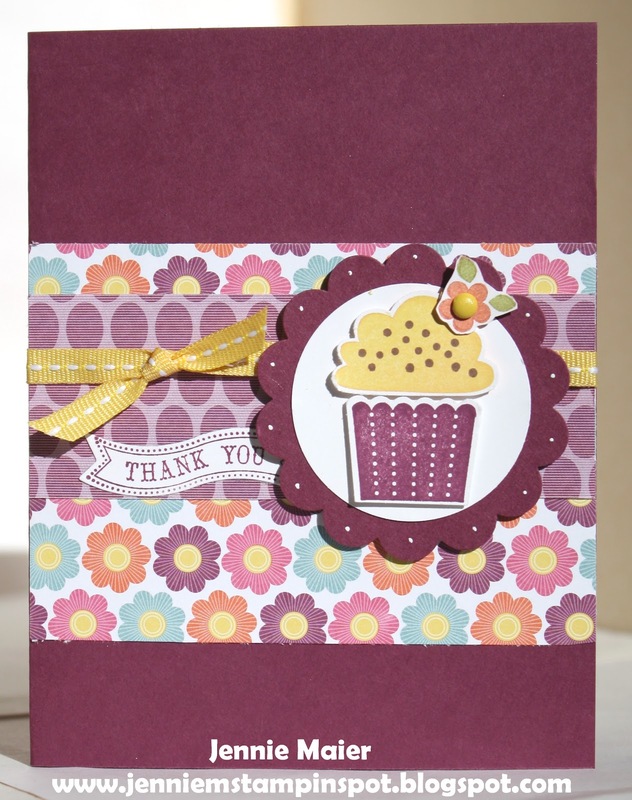 Create a Cupcake and Itty Bitty Banners are the stamp sets again. Just shows you can use these stamp sets for a lot of different occasions! The paper is Floral District DSP. Again, the Cupcake Builder punch is on sale til Nov 28th! Hi Jennie! Great Thank You card! Great DSP! Thanks for joining us this week at Freshly Made Sketches! This is a beautiful card! I love all the little details and embellishments, and the colors, too. Thanks for sharing with us this week at Freshly Made Sketches!